Japan sending out emissaries to learn and report back on best practice from leading countries sounds amazing. But. . . calling out Hiroo Onoda as a representative of the Japanese psyche seems about as reasonable as looking to Charles Manson as a representative of the US psyche. I'm sure one could say lots of interesting things about US culture starting with observations of Manson. But, the connections are subtle and would sound pretty weird coming from someone living elsewhere who's read a few book about the US. As much as I like the factual content, the "Here's something truly astonishing - incredibly broad generalization about a country based on anecdote - meandering monologue on how astonishing that fact is" approach made me feel a bit embarrassed as a listener. I like the podcast better when he's talking about long dead people about whom nobody has more than a vague cartoon understanding. I was happy to see a new, long episode show up in my feed, and am lookin forward to the rest coming out. I was a bit struck by the change in tone when sharing grisly details when compared to Blueprint. In Blueprint, he made special efforts to convey that he was not interested in being disrespectful or sensationalizing the horrific suffering endured by the soldiers. I did not get that same sense in listening to this one. Especially when talking about the accidental bombings of Chinese citizens. It came across as a little too....something. I just finished reading Rana Mitter's Forgotten Ally, a book that covers World War 2 from China's perspective, so it was good timing for this particular podcast be posted here at FanFare. Mitter talks a lot about Chiang Kai-Shek and his general assessment of his WWII period is that he played a bad hand better than expected. So, while it's kind of true when Carlin says the Generalissimo was more interested in fighting Communists in the 30s, I think one has to also acknowledge that Japan's military and economic/political position was simply much better than Nationalist China's. And Chiang knew that, and that is also why he didn't listen to the Chinese warhawks and delayed war as long as possible. 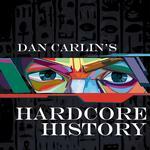 I also did find interesting Carlin's discussion of whether or not the Imperial Japanese were fascists. You can also ask this about Nationalist China's regime during World War II, and after reading Mitter's book, I think it was fairly despotic and authoritarian but I'm not sure it could be compared to German or even Italian fascism.